WASHINGTON — The head of the powerful Alliance of Automobile Manufacturers is leaving to lead Ford's worldwide lobbying efforts. 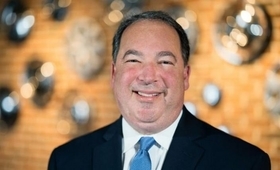 The automaker said Monday that Mitch Bainwol, 59, will be its chief government relations officer, effective March 1. It's been a tumultuous eight months for Ford's policy shop here. Chief lobbyist Ziad Ojakli left in July to join Japan's SoftBank Group. Steve Biegun, vice president of international operations, moved up to manage the Washington office and then left in August to be the State Department's special envoy to North Korea. Curt Magleby, who has directed Ford's lobbying efforts on an interim basis since then, will continue his duties as vice president of U.S. government relations, Ford said. Bainwol will be responsible for helping shape policy and legislation to promote the company's business objectives in areas such as trade, the environment, autonomous vehicles, mobility, safety and taxation. He will report to Joe Hinrichs, Ford's president of global operations. "We are thrilled to have Mitch lead our talented global team of government relations professionals and thank Curt for his leadership over these past few months," Hinrichs said in the Ford statement. "Mitch brings significant policy and legislative experience coupled with a vision for the future of this industry that will be invaluable as we work toward our goal of becoming the world's most trusted company, designing smart vehicles in a smart world." Bainwol has been president of the Alliance since 2011, where he has represented U.S. and foreign brands on a range of issues before the federal and state governments. "Under Mitch's leadership, our industry has come together to advance an innovation agenda focused on the new and emerging opportunities to increase safety, environment responsibility and the freedom of movement," Hinrichs said. Bainwol was chief of staff to Senate Majority Leader Bill Frist and the Republican National Committee after several years as a top aide to Connie Mack, R-Fla., a former U.S. representative and senator. He spent eight years as chairman and CEO of the Recording Industry Association of American before joining the Alliance. It was unclear who would assuming Bainwol's duties at the Alliance. There was no immediate comment from the Alliance. Under Bainwol’s leadership, the Alliance led the effort to reopen the review of Obama-era fuel economy standards for model years 2022-2025 and generate support for legislation governing highway testing of autonomous vehicles. The Trump administration now plans to scale back the fuel economy targets. Congress did not pass autonomous vehicle legislation last session, despite wide support.